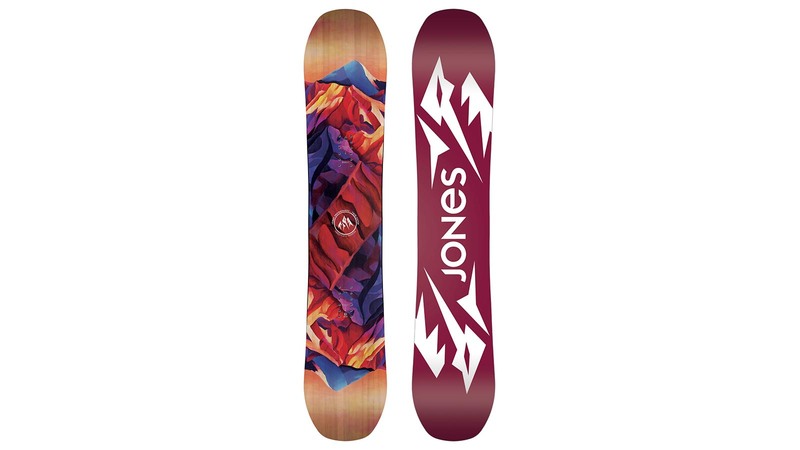 The newly redesigned Jones Mountain Surfer is a next level powder board built to surf the earth without bindings. Surf shaper Chris Christenson and Jeremy Jones completely redesigned the Mountain Surfer using new materials plus complex 3D board contours. The Mountain Surfer’s 3D shape contours include a Spoon nose for float, a 3D center hull for improved glide and 3D stepped edges for turn precision. 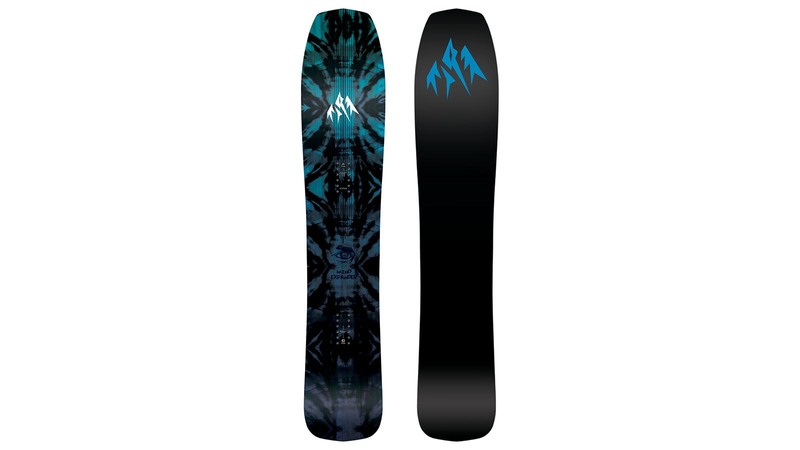 The Mountain Surfer has a sintered p-tex base and a wood core but no metal edges or binding inserts. The Mountain Surfer comes with a foam deck pad and a leash to keep it attached to you when you tumble. The Women’s Mind Expander is an alternative all-mountain board built to slash every terrain feature in sight. Surf shaper Chris Christenson and Jeremy Jones designed the Women’s Mind Expander for the creative rider who draws lines blending freestyle, freeride and surf styles. For playful float in pow the Mind Expander features a Christenson Surf Rocker profile, SPOON 3.0 base contours and a hybrid directional shape. The blunted nose, full size tail and tight sidecut offer the nimble manoeuvrability of a directional board with the freestyle abilities of a directional twin. The Women’s Mind Expander also features our new Web Fused Carbon in the nose to eliminate vibration and smooth out the ride in rough snow. The new Mind Expander Splitboard was built for the creative rider who weaves nimble and playful lines as they slash through the backcountry. Designed by surf shaper Chris Christenson and Jeremy Jones, the Mind Expander Split features a Christenson Surf Rocker profile and a blunted nose for epic float in pow plus a full size tail for legit freestyle performance. The unique shape is matched with a short sidecut for snappy turn potential in tight trees and inner and outer edge Traction Tech for enhanced edge grip on icy skintracks or firm descents. For unmatched torsional board connection in ride mode, the Mind Expander Split also features our Boltless Bridge and Karakoram Ultra Clips. Construction. This is the place where you can talk to us about the new ingredients in your boards, and how you are building differently. We’re interested in anything new in inserts / edges / cores / sidewalls / glue / wood types / base material etc here. For 2019 we’ve incorporated several new materials into our boards. On the Mind Expander, Storm Chaser and Solution splits we’ve added a new web fused carbon layer to the nose of the boards to help eliminate vibration and dampen the ride. The design of this webbed carbon layer was designed by Jones brand manager Xavier Nidecker and the engineers at SWS and is exclusive to Jones. On our Lone Wolf and Aviator models, we’ve used another style carbon dampening layer known as Innegra. Innegra also acts to eliminate vibration and increase the torsional stiffness of the board tips. We build our boards at the SWS factory in the U.A.E. SWS is a state of the art snowboard factory that has helped us develop cutting edge new technologies. We focus on the premium price point but we are also seeing action at the middle price point which is the lowest we go. 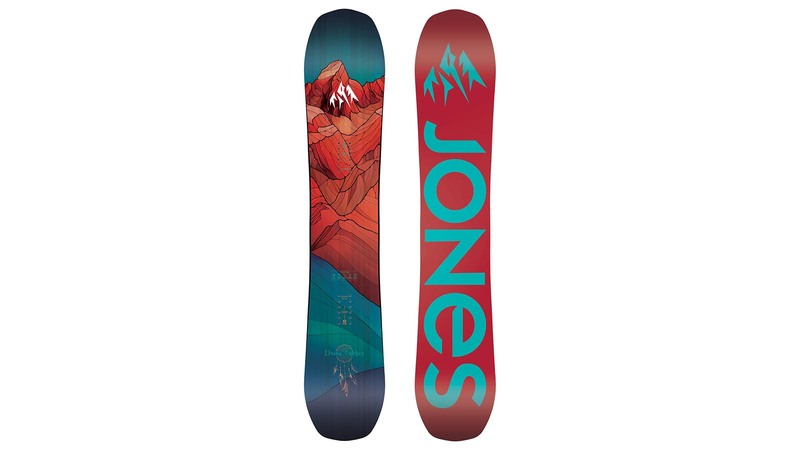 Splitboards of any price are moving like crazy. Insane demand for splits in 2018. Nothing too crazy in our line. Just functional surf inspired shapes with a few standard shape swallow tails. We continue to feature hand drawn and painted mountain art as the graphic focus of our line. This year we feature art from 5 different artists including RP Roberts and Joseph Toney. Our new splitboard models for 2019 are the Mind Expander Split and the Mountain Twin Split. The Mind Expander Split brings our new favorite shape to the backcountry for endless wind slashing. The Mountain Twin Split returns to the line after several seasons not in production. The Mountain Twin split rounds out our split line as we know offer every style of splitboard shape possible – directional freeride, all-mountain, surf-inspired and directional twin. On our best selling Solution splits, we’ve added a new web fused carbon layer to even further energize the ride of these legendary models. We focus on highlight snowboarding and specifically backcountry snowboarding, as achievable and accessible challenges for your average rider. You don’t need to be a ridiculously talented rider to go outside the boundaries and find amazing snow and rewarding wilderness experiences. But you do need get educated about backcountry safety before stepping out. As far as inspiring younger generations to ride, we see the elementary and middle school aged youth as critical future customers. While it’s hard to reach them directly, we hope to reach them through their parents who might even be skiers themselves, but they respect the ethics of our company. We are focused on telling the stories behind both the design of our products and the adventures that we embark on with our boards. Going beyond just our team riders, this season we will begin supporting the dreams of motivated amateur riders that we are not directly affiliated with through a public grant program. We also have a unique public photo sharing platform that we will debut soon. The goal is to reach out to all riders of all abilities from all over the world and share in the common stoke of both snowboarding and wilderness exploration.